Coliphage λ is a temperate virus. A fraction of λ infected bacterial cells survive, and some of the survivors become lysogens. 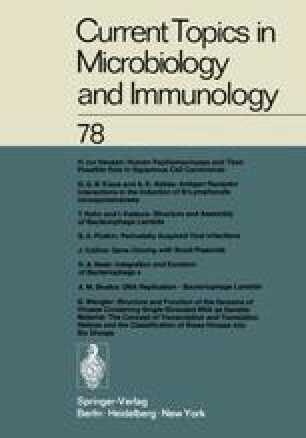 Lysogens are bacteria that have stably acquired two new properties, i.e., immunity to infection by a further challenge of virus and the capacity to produce infective virus. The new properties reflect the presence of λ prophage, the genome of λ virus as it occurs in lysogens. Lysogenization, the establishment of the prophage-containing state, was recognized early to depend on two potentially independent processes. First, lytic growth of the virus must be prevented or the infected cell will die. This process is accomplished primarily by λ repressor whose molecular basis of action and role in lysogeny are described in detail in recent reviews (Pirrotta, 1976); Ptashne et al., 1976). Second, the prophage must be made to replicate in parity with the host genome. For lysogens of phage λ, this is accomplished by the insertion of the entire viral genome into the host genome, forming a single continuous chromosome in which the viral DNA is replicated as part of the host genome.